These suspended display systems are one of the most distinctive showcases we have on offer! What are you looking for out of your ceiling mounted showcase? Versatility? Durability? The ability to display numerous art works at once? These suspended display systems, also known as suspension kits, can give you all of those factors and more. 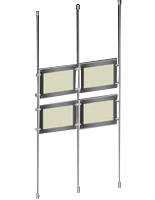 Modern, stylish construction materials help these cable suspension kits a contemporary appearance. The suspended display systems are made from steel ropes and acrylic frames. These sturdy materials can stand up to years of use, making them a good value for your money. The versatility of these suspended display systems for retail locations also translates into added value. By mounting these signs in the front window of an institution you're able to attract customers on the sidewalk with large, vibrant advertisements and entice them inside. Since they're hanging, however, the opposite side of the frames can be used to showcase advertisements and retail store specials to the customers already shopping on the inside. These suspended display systems that are affordable can be used in other locations in the store aside from front windows too! The hardware that's included in with these kits is what allows you to accomplish that. Hanging hardware isn't the only item that's in a window cable display set. These suspension sets come with every piece of equipment that you need in order to create a complete advertising showcase. Your kit comes with 16 foot lengths of stainless steel wire for mounting your signage by the wall or directly from the ceiling. This steel wire has been coated in nylon for two reasons: to give the cords a smooth appearance and to protect users and visitors in case the steel rope ever frays. The hanging hardware that comes with your kit is high quality, with mounting screws and plastic anchors engineered to hook into both the floor and the ceiling to support the rod and cables of the display. 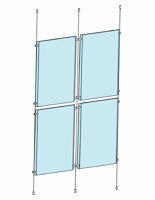 Aluminum panel grippers with a satin silver anodized finish hold the acrylic panels on the wires securely. Finally, we have the frames which are crafted from precision laser cut acrylic. They've got a borderless design thanks to a folding construction, which also allows for easy art work changes via the open slot at the top of the structure. What sizes do these acrylic frames come in? What else can these kits do for your retail store or business? Utilizing signage in the front display of a store is one of the best ways to help increase both foot traffic and sales. You can also keep passersby aware of exactly what's happening inside your store, what specials are occurring and what new products have arrived with these suspension sets. There are many stores, restaurants, and other businesses out there where floor space is at a total premium. When your art is hanging from the ceiling or the wall, instead of placed in a bulky floor standing structure, you'll be able to easily free up space on the sales floor for your customers to walk through, or for storing more merchandise. 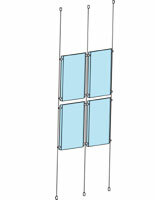 These cable, rod, and panel kits come in a wide selection of matrices. If you want a retail display that only uses two (2) panels, those are available. If you're looking for one that's got twelve (12) frames, we've got those too. Many of the components involved in these kits are also sold separately on our website, allowing you to create a custom display that suits your exact needs. Installation is simple and can be accomplished in a matter of minutes. 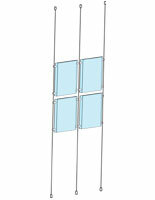 The sets can also be installed almost anyplace in a store. Mount the frames to the ceiling near a wall to give the impression of a modern wall display, or set up in the middle of the floor to create a barrier with images on either side of the showcase. These suspension sets are offered at a fairly reasonable price. You'll be able to get an beautiful and modern showcase that can be customized to meet your specifications at a price that won't damage your operating budget. The number of places that can use these showcases is wide and varied! Retail stores, such as clothing stores, bookshops, convenience stores, and more can use them to let patrons know what new inventory they've just got in or what items have just gone on sale. Since the signage can be changed out so quickly it's easy to keep the displays refreshed with the latest information. Restaurants and bars can use the wall signs to showcase the daily food specials, or if they have any deals on drinks they want their customers to know about. Hanging sets like these can also be found in the front windows or real estate agencies, full up with the homes and apartments that have just gone on the market and giving interested passersby a preview of what's available. They're also a good way to keep patrons entertained and interested while in a waiting area, such as an office suite waiting room or queued up at a bank. Art galleries can use them as a unique way to showcase art and other print based works. Really, the ways these signs can be used are only limited by your imagination!